Who wrote this? Why define another person? Defining other people is the essence of abuse. No matter if the definition is true or not, God appoints our country's leaders; He sets up kingdoms and He tears them down. Let us not make lite of, make accusations of or put-down what God has under control. NO human leader is perfect, NONE have been for ALL have sinned. Cool response because I actually thought of that verse. I think it is borderline, I am mocking him, but technically I am really mocking science, but I do mock his belief in science. if you believe the biblical account of creation, by faith-fine- if not..
Creationism- The belief that evolution is dumb.. So I win by default.... that's how this evidence stuff works... right? Nope, actually there is quite a large some of evidence, archaeologically, genetically..etc that proves our case.. I have posted a link to such evidence for you in another response.. It is several hours worth of solid scientific fact, so it will take you a few days, or more to watch it all, depending on how much time you have.. Simply put I don't have enough faith to believe in evolution..
Just recently I've had some interesting talks about evolution with a former science teacher. He mentioned that he had pictures comparing the embryos of humans, dogs, fish, chickens etc., and said that they were very similar, and that the human embryo has a tail and gills at a certain stage in its development. Have any of you seen/studied those pictures? It turns out that those pictures were frauds (very popular frauds), and yet the same pictures persist [in some books] even to this day. In Haeckle's original comparisons of dog, chicken, and turtle embryos (published in 1868), it was discovered that the pictures were too much alike. Upon investigation, it was found that Haeckle had actually used the same wood-cut for each one! 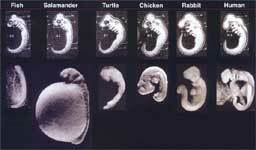 Bottom Row: Richardson’s photographs of how the embryos really look at the same stage. (From left: Salmo salar, Cryptobranchus allegheniensis, Emys orbicularis, Gallus gallus, Oryctolagus cuniculus, Homo sapiens.) Many modern evolutionists no longer claim that the human embryo repeats the adult stages of its alleged evolutionary ancestors, but point to Haeckel’s drawings (top row) to claim that it repeats the embryonic stages. However, even this alleged support for evolution is now revealed as being based on faked drawings.